The 3rd round of the Nulon Nationals was held at Wakefield Raceway in NSW on the 24th of July, 10 car clubs arrived at a cold but dry track for a drivers briefing and introduction to the layout of the day. Round 3 was run as a Time Attack event, the 65+ field was divided into 6 groups (based on est time), each driver got 4-5 sessions throughout the day with the single fastest time winning the event. One of the biggest fields we have had at a Nationals event including street cars, home built race cars all the way to full blown GT production cars. Lets take a look at the teams and some of the cars that entered the day. This was the first Nationals event for Allan, although he was no stranger to Wakefield or events similar to this, his PRB Clubman was impressive, just missing out on a podium spot coming in 4th place. Allen produced one of the best stories of the day, This track spec Clubman drove to and from the track which made it not only the fastest Under 4L car at the event, but he also took out the Fastest Street Car award. A huge effort if you ask us, as we handed him his trophies, the storm clouds were looming and we haven’t heard from him since, so we hope he didn’t get to wet on the way home. Having a fast car is one thing, having the skill to drive it around Wakefield in a 1:04.1 is certainly another. Michael from RTDC is no stranger to the Nulon Nationals events, his big power R34 GTR has also featured on these pages before. We just cant stop looking at it. Its not the built 3L bottom end, polished engine bay or the 400klw+ It is the way he presents the car. Michael is not shy of driving this car like he stole it, yet every event he comes to, it is one of the cleanest cars there. The attention to detail is amazing. Yet you watch him on track and he chucks it round like it was his first $500.00 clanger. Michael truely has the best of both worlds. 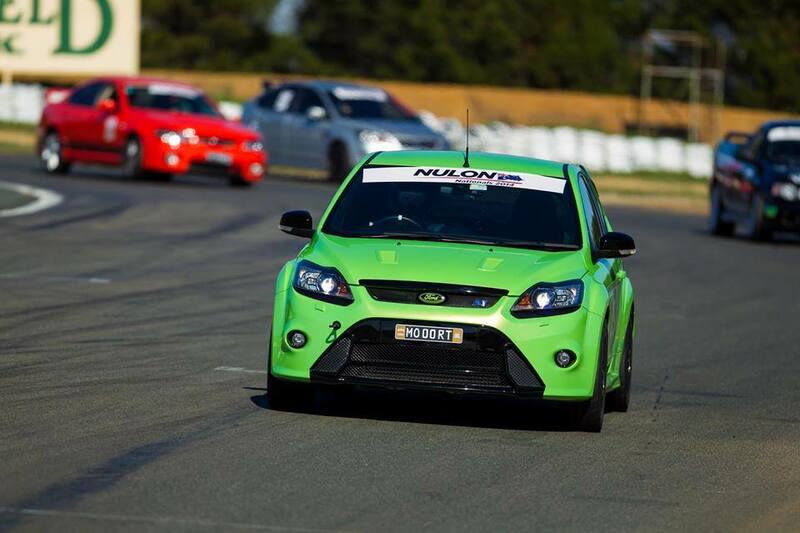 Adam Burgess from the Ford owners club has driven a different car at every event this year which is what we love to see. Owning a BA XR6 turbo he was entered into the Ford Owners club at the start of the year. What this event has done is unleashes his garage of top level race cars, Round 2 he arrived in the tarmac rally spec FD RX-7 and round 3 he treated us all to the sights of a Genetta G50 English GT Production car. The first time this car has been run on anything but slicks was always going to be interesting to watch. But Adam showcased his skill and piloted the car to a 1:06.1 which gave him a top 10 finish edging out cars with 3 times his power. Turbo Charlie from Evolution Oz was a late addition to their team, but what a catch. With a well sorted car and the skill level behind the wheel, it gave the Evo team maximum points with a 3rd place finish. Turbo Charlie rocketed in at a 1:03.4 to secure 3rd place on a day that seemed to favour the AWD weapons. His Evolution IX RS was super quick and made up most of his time on the back section of Wakefield Park, trying to follow him through the fish hook also caught a few people out. He sure knows the car and the track very well. Jason Wright from the HSV Club took out second place at the event. You may know Jason’s name from World Time Attack, Green must be a theme of his, as he owns 2 rocket ships, one is known as the Hulk, a green WRX STI which holds claim to the fastest Subaru in Aus. Now not far behind it is his Mitsubishi Evolution nicknamed “Shrek” clocking in a 1:03.1 on his second lap just shows us how well Jason has set this car up. A small mechanical issue forced him to park the car up early again this year which is a shame as he missed the top spot on the podium by around 1 second. Benny Tran from the Honda Owners club took out 1st place at Round 3 of the Nulon Nationals in one of Australia’s fastest FWD cars. The BYP Integra is a real machine, over 350klw at the wheels, what is most impressive about it is the tuning that has gone into the ECU. All of the BYP cars that ran at Wakefield had Traction control including the Integra. BYP custom made splitters and defussers also helped keep this car on the ground, although we do have footage of a turn 10 high speed drift which ended in some grass being cleaned off the roof, all in all this car was planted all day. Benny and the Honda team have now won 2 out of 3 events in this car which hasn’t been done before. To beat the AWD cars that attended this event on a greasy track was a true feat. As you can see, Skylines Australia took the round win, closely followed by Evolution Oz and HSV Owners club. This makes round 4 very interesting as RTDC has lost a lot of their lead. Round 4 will favour the big HP cars such as HSV and SAU and with bonus points coming into play for cars that attend 3 or more events, teams like Honda and 86 Drivers club are not out of the picture either. Lets take a look at the top 20 drivers. After 2 wins in a row Benny Tran leaps into 5th spot. Trent also extends his lead over the field in the number 1 position. The great thing about this leader board is it isn’t dominated by 1 team, We have MX-5 , 86, HSV, Ford etc all with Drivers that can make the Top 10 leader board at the end of the year. Nulon Oils will be announcing what these drivers will be fighting for in the coming weeks, stay tuned.